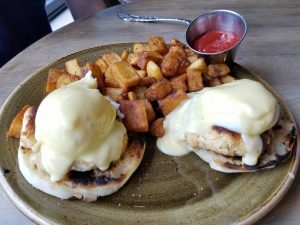 On our last day in DC, Hubba Hubby and I walked around near our Air BNB to find brunch. We’d unfortunately learned a very difficult lesson the day prior — I am unable to sit for long periods of time, so road trips are becoming increasingly difficult for me while pregnant (this is something that I cannot stress enough: I am so, so disappointed, because the largest part of me shrieks “I can still do anything I could do before I got pregnant” but the reality is some things cause me so much pain or discomfort that it truly isn’t worth it). To that end, I needed to get in a bit of exercise prior to eating and then sitting in the car for hours to get back home, and Hubba Hubby indulged me walking for nearly an hour of hangry chatter while I browsed menus at every restaurant we passed and finally decided on the first place we’d entered: Provision 14. As his reward, I mean brunch, he chose crab cake Benedict. I tried some of his potatoes and oh my god they were amazing – crispy on the outside, well-seasoned, and fluffy potato on the inside. 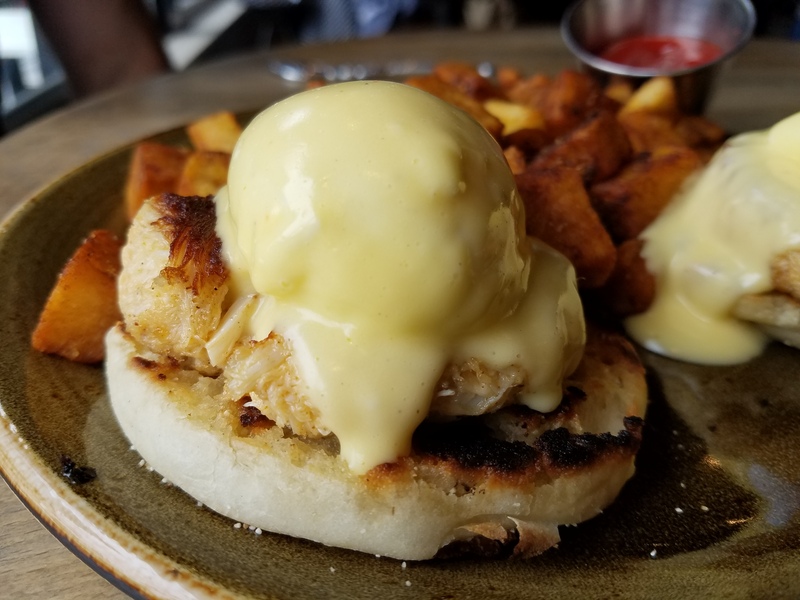 As for the Benedict portion, I only tried a bite of the crabcake and thought it was fine. A little soft, a little bland, a little too much filler and not “jumbo lump” enough — but I bet it was good eaten with poached egg and Hollandaise!! Hubba Hubby was satisfied enough but I don’t think the dish wowed him either. I chose what sounded like the most interesting dish on the brunch menu: breakfast tots!! Tater tots, scrambled eggs, and bacon. I did not expect it to arrive looking like this, but I shrugged it off; I love cheese, and the whole dish held a lot of promise. I knew I was playing with fire with my scrambled egg aversion – I didn’t hope that they could be as good as the ones at DBGB had been – but whoa, did this dish disappoint. Everything was so dry! The scrambled eggs were cooked to within an inch of their lives to the point they were crumbly-dry, so sad!! The bacon was overly salty and crumbled into tiny dust bits. The cheese somehow managed to be dry and un-oily which is odd because if you use very cheap cheese, it tends to be very oily — but nope, this was dry too. The only part that was tasty? the tater tots, which I wound up digging through the entire dish to get to and eating them with a little ketchup, just for moisture. 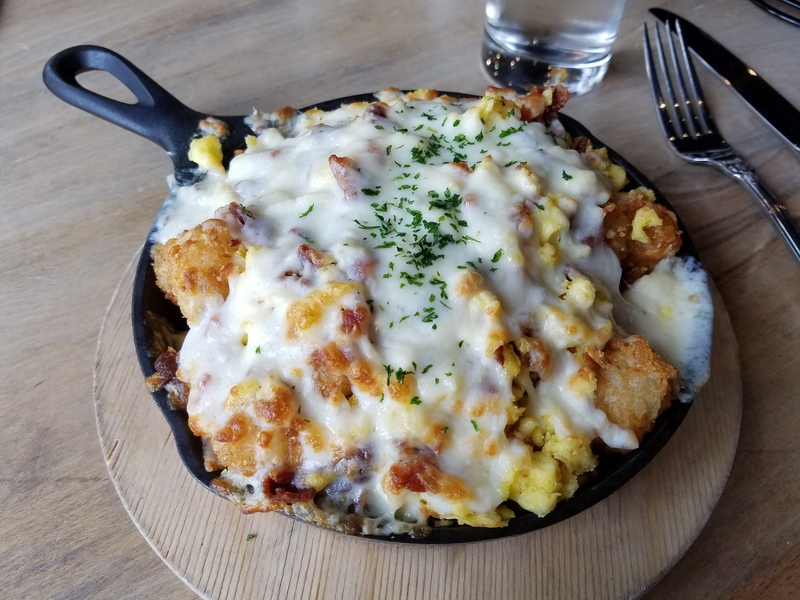 It was a very unpleasant dish and Hubba Hubby suggested, then begged me to order another dish, but I was full eating all the tots from this one so there was no need. It was just so, so, so disappointing. Ah well — I can make my own sometime soon, and make them DELICIOUS!!! In fact… I think I will. Soon!